The U.S. housing market was largely influenced by the economic crisis in 2008. In fact, the housing bubble itself contributed to the development of the financial crisis. Very attractive house prices, low mortgage interest rates and low standards for mortgage loans resulted in growth of subprime debt. 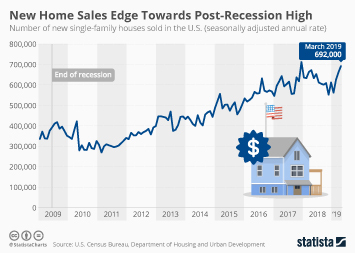 The U.S. house prices, as reflected by the S&P/Case Shiller U.S. National Home Price Index grew rapidly from 2000 to 2006, when they reached their peak, and then started to fall down in the following years. The house price growth trend began in 2012 again and since 2016 the house price index has exceeded its value from 2006. There were 614 thousand houses sold in the United States in 2017 - the largest figure since 2008. The U.S. homeownership rate on the other hand has been on decline since 2005 and amounted to 64.2% in 2017. Home flipping is a real estate term which refers to the practice of an investor buying property with the aim of reselling them for a profit. In 2017, the number of single family homes and condos flipped reached 207,000 in the U.S.
A master-planned community is a residential community which has an above average number of recreational amenities such as parks, golf courses, lakes, bike paths and jogging trails. Texas was the most popular state for master-planned communities, followed by Florida. Number of housing units in the U.S.